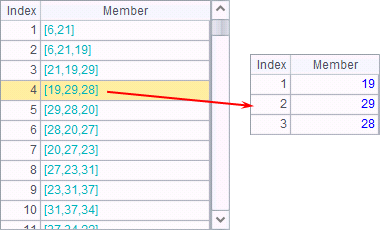 After data is imported from a data table, often it may need to be grouped as required, or an aggregate operation is needed. In esProc, groups function can compute the aggregate result directly; group function is used to group data first, and then perform further analysis and computation. For big data processing, however, records can’t be loaded into the memory all togerther for grouping; sometimes the groups are big and the grouping and aggregation result can’t be returned all at once. Both occasions require the use of external memory grouping. Let’s create a big, simple data table for containing employee information, which includes three fields: employee ID, state and birthday. The employee IDs will be generated sequentially; the states are entered in abbreviations obtained arbitrarily from the STATES table of demo database; birthdays are the dates selected arbitrarily within 10,000 days before 1994-1-1.The data table will be stored as a bin file for convenience. 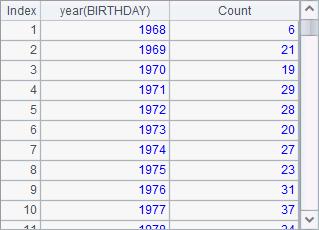 Here each temporary file is the result of grouping and aggregating a part of the whole data by Birthday. A grand cursor composed of all temporary file cursors will be merged and returned by the esProc program. When generating the temporary files, the program will set a suitable number of rows for each temporary file for the convenience of computation according to the available memory space.